(POW-EVD) - On 26 March 1944 mission #128 to Wizernes, France in B-17G #42-31929 Tennessee Hillbilly (427BS) GN-R. Hit just a few seconds before "bombs away". It peeled off to the right passing under the #4 B-17 and went into a shallow dive. Tennessee Hillbilly nosed down in a half-spin with the left wing on fire. The left wing fell off and the B-17 made a three-quarter turn before it exploded in mid-air and crashed at Lederzelle, 10 Km NE of St. Omer. 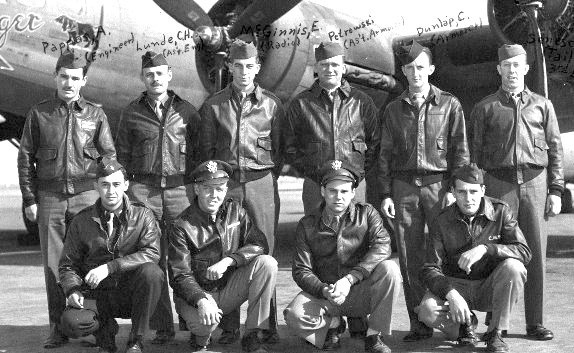 Eight parachutes were seen to open before the B-17 blew up. (**) Pappas (E), Lunde (WG) & Petrowski (A/Arm) were not members of the original crew at Molesworth. (1) Kersch (B) -After parachuting was taken to a farm family near St. Omer on the Belgium border south of Dunkerque. They gave him a new name - Albert De Groote. After several months, he made contact with the French Underground and assisted them in successfully robbing the Nieppe Townhall on 20 July 1944. The stolen money and food coupons were used for underground needs. He spent six months working with the underground and evading capture. Returned to England on 19 Sept 44. Later in August and early September, he helped in "Sabotage" and attacks on retreating German soldiers and came back to Nieppe many times later on.